Make it easy for customers to find your local business with Bing Ads location extension targeting. By including a business address and phone number directly in your ads, you can help local searchers, who might be right around the corner, find your business. Customers will see your address, phone number, and a link to directions, in addition to your company URL and descriptions. A click on the Directions link will bring up Bing Maps or Yahoo Maps on a PC, tablet or smartphone, automatically populate your business location into the map directions, and if on a smartphone, provide turn-by-turn guidance. If your business has multiple storefronts, you can display up to two addresses with Location Extensions. 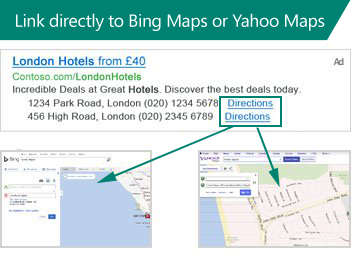 Bing Ads dynamically selects the two most relevant locations based on a user’s location or search. This increases your business exposure and helps customers find you. In addition to driving more local traffic to your stores, Bing Ads location extensions can increase click-through rates 7 to 10%. Relevant local information helps inform and engage customers before they visit your business. Clicks on a Location Extension costs the same as a click on your text ad title or URL. Read How to add your business using Location Extensions for instructions, then sign in to show your address and directions across your campaigns. Want to make your ads even more effective? Let customers call you directly from your ad with Call Extensions, and add Sitelink Extensions to boost traffic and take searchers to specific pages on your site.